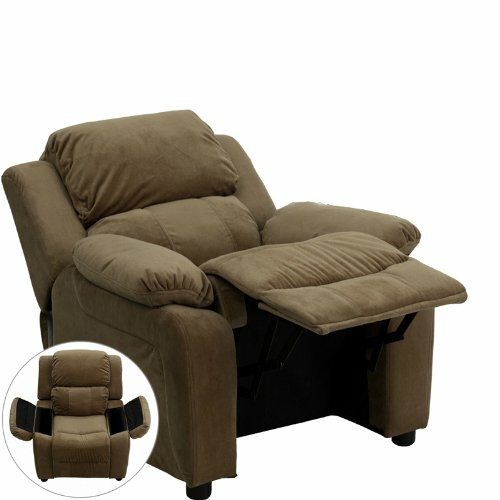 The child-sized recliner with deluxe padding is a perfect spot for kids to watch TV, play video games or read their favorite book.It's covered with soft and snuggly microfiber upholstery and features flip-up storage arms for remote controls, books and game controllers. This sturdy little recliner has a solid hardwood frame, soft foam padding and durable upholstery that cleans easily with a damp cloth. It has raised black plastic feet, and will hold up to 90 pounds. Designed with safety in mind, it's filled with CA117 fire retardant foam, and reclines only when a child is seated and the footrest is pulled out one inch.This cozy kids recliner will be a welcome addition to your living room or your child's bedroom or playroom.